A place like Luxembourg is paradigmatic for the idea of small sized destinations with major impact on the political, cultural, economical, technological and banking life of the world. 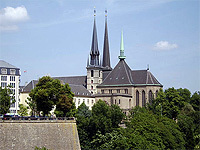 The historic heritage of this landlocked country (in case one refers to the Grand Duchy of Luxembourg) and the particular historic background of its capital (Luxembourg City) have assigned to Luxembourg the task of being the one continental borderline between the Latin and German cultures, a feature which is reflected in both demographics and cuisine, as well as in language and overall culture. Formerly dubbed the Gibraltar of the North, this surname is extremely adequate for what might generally be indicated as description of Luxembourg: a vital link between two worlds. The fact that Luxembourg City is the only one to have been twice assigned European Cultural Capital, the fact that the Grand Duchy is one of the founding members of the United Nations, of NATO and of the European Union, of Benelux and, finally, of OECD prove that this small country has something to say politically, economically and culturally speaking. The history of both Luxembourg City and the Grand Duchy of Luxembourg revolves around, as to their origins, the so called Lucilinburhuc (or the Luxembourg Castle), which was acquired by Siegfried, Count of Ardennes, in 963. This was the hub around which the future city of Luxembourg took shape, a city which later became the capital of the homonymous Grand Duchy. Given its huge strategic and geographic position, Luxembourg was repeatedly coveted after by many historic dynasties and political forces, such as the Bourbons, the Habsburgs, the Hohenzollerns, not to mention the French, whereas Prussia, the Netherlands and Belgium made their attempts to gain Luxembourg for their own during the contemporary age. Nowadays, Luxembourg is a spot one can not disregard in terms of political, economical, banking and modern technical infrastructure activities. As far as accommodation is concerned, what is valid for Luxembourg City holds true about the entire Duchy. Thus, the more central hotels’ location is, the pricier the services they offer are. But this is no surprise, given the number of political and economical institutions and headquarters hosted here. It is acknowledged that Luxembourg has a solid infrastructure servicing the need for accommodation of business travelers in particular. However, leisure travelers should pay attention to this crucial aspect of their trip, given both the expensiveness of services and the fact that accommodation is likely to become an issue. Given its geographical and cultural position – Luxembourg is situated on the borderline between what is Germanic and what is Latin in Europe – it is nothing but a common expectation to discover here influences received from both of these worlds. Indeed, the strongest flavors overlooking the Luxembourgish cuisine are of French and German origin, but the newer Portuguese and Italian influences have already been ascertained. Thus, advised dainty feeders will be able to tell the German heartiness of the thuringer (a local small spicy sausage), the Italian thrill of the eisleker ham (smoked raw ham) or the French daintiness in the kachkeis (cooked cheese) and the pasty. What is great about Luxembourg (the city and the Duchy alike) is that it is a major destination despite its size. Both the city and the country are replete with landmarks charged with historic and cultural significance. An exhaustive list could hardly be drawn, but thorough tourists should know that mobilizing all their planning skills is the best chance for them to tick off all or, more reasonably, most of the interesting objectives in Luxembourg. To start with, the fact that the city of Luxembourg proper is on the UNESCO World Heritage List is stimulating enough. However, the National Museum of History and Art and the Grand Duke Jean Museum of Modern Art (both located in the city) belong to the category of must-see landmarks. The National Museum of Military History (located in Diekirch) is also worth visiting. The annual events in Luxembourg refer to, for instance, the ING Marathon, which is hardly looked forward by locals and competitors, to the so called Trauliicht get gebrannt (boys scarring girls), the Walnut Market in Vianden, the Broom Flower Festival (in Ardennes), and to the Dancing Procession of Echternach. The eventful calendar of Luxembourg is complemented by other manifestations, such as the National Day, the Schueberfouer and the New Orleans Meets Luxembourg Festival. Locals are also very fond of the Luxembourg City Christmas Market for reasons easy to understand. Its inherent tourist assets aside, Luxembourg is an excellent starting point for exploring the nearby destinations. Metz, for instance, is worth visiting at least by title of sampling the famed and ebullient gastronomic specialties of the place. It’s not for nothing that Francois Rabelais is said to have been inspired by the Metz cuisine when he conceived Gargantua and Pantagruel. For a place overwhelmed by its political and historical importance, tourists should head for Strasbourg. Strasbourg is also a great destination in terms of cultural tourism, since it has inspired for centuries figures like Gutenberg, Calvin, Goethe, Pasteur and Ricoeur. Utrecht is excellent as a source of Netherlander liveliness. Shopping, gastronomy and sightseeing are, some might rightfully say, at their best in Utrecht once in the Netherlands. Allegedly the oldest city of Germany and formerly dubbed the Second Rome, Trier does not put forward its historic reputation exclusively. Visitors might be surprised to find out it is also the birthplace of Karl Marx, which is always interesting to explore if studied in the field of political and economic philosophy. The Hague is, by far, the most recommendable destination in terms of what it means for a city to turn its political and legal significance into a tourist asset. But once in The Hague, one should always indulge in the most inviting offer of the national cuisine of the Netherlands. Amsterdam is the rightful capital of the Netherlands also by force of the fact it manages to cluster the unique character of this country and to exhale it into the miscellaneous plethora of tourist objectives. Dubbed the Venice of the North, Amsterdam is a definite stop on the tourist circuit of the Netherlands. The Hotel du Commerce is beautifully situated on the pituresque market square of the town of Echternach.Our hotel has 44 rooms with shower or bath, WC, TV and telephone. The National Museum of History and Art of Luxembourg displays temporary exhibitions and permanent archeological collections, valuable medieval paintings.